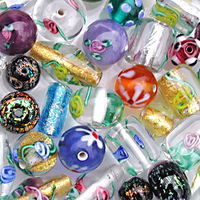 Our great selection of glass beads includes Czech handmade lampwork, pressed glass and bead mixes. Glass beads have been made by hand and used for adornment and trade for centuries. We don't know when or how it first started, but archaeologists have found early production sites throughout the Middle East. As early as 2400 BC, glass beads were being made in the Caucasus and Mesopotamia, which are modern Iraq and Iran, respectively. Within a few hundred years glass beads were being made throughout the Mediterranean, India and Europe. Some of the earliest known beadweaving comes from the Old Kingdom period in Egypt circa 2200 BC.